This FULL-COLOR hiking guide offers you a personalized tour of the best day hikes the Eastern Sierra has to offer. With a vivid history and unmatched natural beauty, the Eastern Sierra is a gateway to the Owens Valley, the White and Inyo Mountains, and the Sierra Nevada range. Within this vast area, many breathtaking landscapes and vistas are accessible as day hikes year-round. Join us as we guide you to places that will surprise and inspire you. From the canyons, lakes and aspen forests of the Sierra Mountains, to the ancient Bristlecone groves and desolate beauty of the White and Inyo mountain ranges, there is so much to see and do. Are you ready to turn an ordinary day into an outdoor adventure? 50 Classic Day Hikes of the Eastern Sierra takes you there. • Mammoth Lakes to Mount Whitney, California. • Detailed instructions on driving to, following, and enjoying each of these hand-picked classic day hikes. 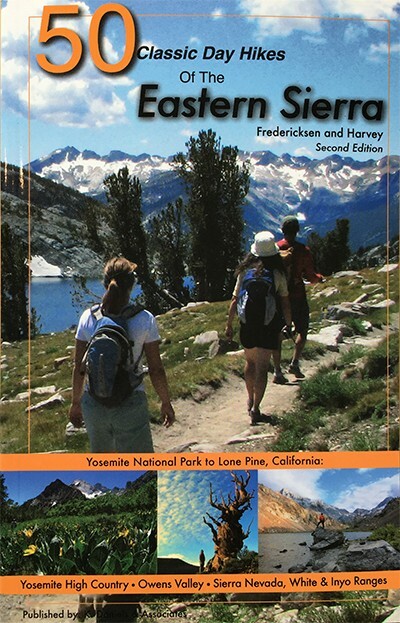 • Stunning full-color photographs, maps and helpful color-coded graphics. • Informational sidebars covering natural and human history, interesting facts, and tips about the area.